Why using dynamic braking resistor in motor speed controls? The power developed by Induction motor during idling time if wasted in power resistor used for braking is called dynamic braking resistor. 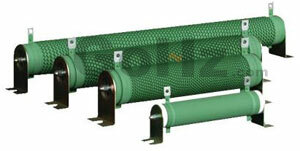 Dynamic braking resistors are used to dissipate the power generated by the motors during dynamic braking. Typically, the variable frequency drive (VFD) will rectify the power back to a DC source and the resistors are cut into the dc link via a heavy-duty contactor. The power is then converted to heat in the braking resistor grids. These resistors must be actively cooled to prevent a fire. Many years ago, I was technically supporting automation products like VFD and I know how they work regarding Regenerative Energy. First, in braking situation the mechanical energy will push on the electric motor and send back electrical energy to the VFD and the VFD will convert it back to DC Energy inside on the DC Bus that is filtered by Capacitors. This will tend to increase the DC Voltage to a point where the capacitors can burst or power electronics can be damaged. Most of the Braking systems I saw were using and electronic circuit that supervise the DC Voltage of the Bus and then, if the voltage is too high, would set ON a power transistor that would drain that energy to braking resistors. Most of the time, when possible, these resistors were put outside the building or in a well-ventilated place. But, I saw regenerative energy in situation where the speed was constant. One example: In a saw mill machinery where there is rollers with teeth that push the tree inside the machine and rollers at the other end that will pull it. At the beginning the motor that push the tree is consuming electrical energy but as soon as the tree is entering the saws inside the machine, the tree is pulled by the saws and the rollers need to maintain the tree at a constant speed or brake it if you like. So the electric motor that controls the rollers needs a braking resistor to dissipate that energy. Same thing will happen to the rollers at the output. There is a lot of other situation with regenerative energy where you would not expect any. Sometimes you will see some in applications using eccentric loads. One important possibility when you have more than one motor running and not all are regenerating, then all can share common DC bus so the regenerated energy is easily available for other motors, so breaking resistor waste less energy or may be no waste of energy.